Even though the Minnesota Wild kept their end of the deal by trouncing the sliding Winnipeg Jets 5-1 at home on April 3rd they’re now officially out of the playoff race. Devan Dubnyk was solid in net with 32 saves and Zach Parise led the scoring with a pair of goals, but scores elsewhere in the Western Conference proved to be fatal to the Wild’s playoff hopes. The final nail was hammered into Minnesota’s coffin when the Colorado Avalanche fought back from a 2-0 deficit at home to trounce the Edmonton Oilers by a convincing 6-2 score. This left the Wild on the outside looking in since they now trail Colorado for the second wild card spot by five points with each team having just two games to go. It’s the first time since the 2011/12 season that Minnesota won’t be taking part in the postseason. 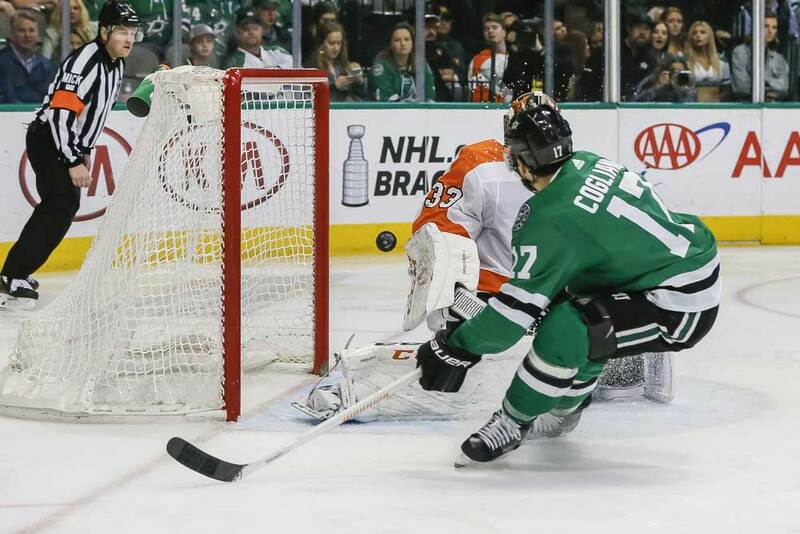 While there was sorrow in Minneapolis there was joy in Dallas as the Stars sewed up a playoff berth with a 6-2 home beat down of the visiting Philadelphia Flyers. Dallas had a chance to lock up a postseason spot three days earlier, but fell one point short when they were edged 3-2 in a shootout by the Canucks out in Vancouver. Dallas, who last made the playoffs in 2015/16, currently sit in the first wild card spot. However, they could possibly slip to the second position as Colorado sits three points behind them with each team having a pair of games left on the schedule. Dallas could also possibly catch the St. Louis Blues for third place in the Central Division, but it seems quite unlikely as the Stars trail the Blues by three points with St. Louis still having three games to play. The Stars visit the Chicago Blackhawks on April 5th and then wind up the season the next night with a home game against the Wild. Meanwhile, the Avalanche hosts Winnipeg on April 4th and visit the San Jose Sharks on the 6th in their season finale. The Avalanche may need to win both games, depending on how the Arizona Coyotes fare, with the second wild card team guaranteed to face off against the Western Conference champion Calgary Flames in the first round of the playoffs. As for the Blues, they visit Chicago on April 3rd, host Philadelphia on the 4th and the Vancouver Canucks on the 6th. Colorado is by no means home and dry as they enter their final two games of the season with a four-point lead over the Coyotes. Arizona also has two games to play as they are in Las Vegas against the Golden Knights on April 4th and host the Jets on the 6th to end the season. The Coyotes now need some type of minor miracle to reach the playoffs though after they were beaten 3-1 at home by the lowly Los Angeles Kings on April 2nd. Arizona now needs to win their final two games in the regulation 60 minutes or in overtime and hope Colorado lose both of their contests in regulation time since the Avalanche holds the tiebreaker in regulation/overtime wins (ROW). Arizona’s task of making the playoffs for the first time since 2011/12 will be even tougher if goaltender Darcy Kuemper isn’t able to play the final two games. Kuemper was injured in the loss to the Kings when Trevor Lewis‘ stick went through the goalie’s face mask after giving Los Angeles a 2-1 third-period lead. The stick apparently made contact with Kuemper’s right eye and the goaltender had to leave the game at the 3:29 mark of the third period. Calvin Pickard took over in net and didn’t give up a goal as the Kings’ third marker of the game came when he was pulled in favor of an extra attacker. Kuemper took over the crease for Arizona in late November when Antti Raanta‘s season ended due to injury. The 28-year-old Kuemper had never played more than 31 games in a season and has now appeared in 54 with the Coyotes this season. The game against the Kings was his 21st consecutive start since mid-February. Kuemper, who hails from Saskatoon, Saskatchewan, has gone 26-20-8 this season with a goals-against average of 2.35 and a 92.4 save percentage. It’s unclear at the moment if Kuemper will be back in net this season got the Coyotes, but the team is already on life support heading into its final two games. If Kuemper can’t go then their chances basically go from slim to none. The Coyotes are just 2-4-2 in their past eight outings and have scored only 12 goals. The power-play has gone AWOL as it’s scored just once in the past 22 chances and things are looking pretty grim. Still, it’s been a successful campaign overall for the club under head coach Rick Tocchet. It’s a bit remarkable they’re still in the playoff race this late in the year considering they don’t have a 20-goal scorer in the lineup and their top point-getter, Clayton Keller, has notched just 46 points. They also made a questionable trade when they shipped Dylan Strome and Brandon Perlini to Chicago for fellow forward Nick Schmaltz. To make matters worse, Schmaltz then went down with a season-ending injury shortly after arriving. Miracles have happened before though and the Coyotes are still mathematically alive, so we’ll just have to wait and see what happens next.